It's time for another Young Crafters Unite Challenge! The challenge this month is to use warm and cozy colors. Here is my Warm & Cozy color creation. For this card I inked a piece of white cardstock with scattered straw in the bottom left corner, wild honey, and spiced marmalade in the upper right corner. Then I flicked water & heirloom gold perfect pearls on the panel. The leaves are misted with red mist and a little bit of the perfect pearls gold. This photo shows the shine a bit more. When I finished I discovered I had a tiny bit of brown ink right in middle of my panel...OH NO! 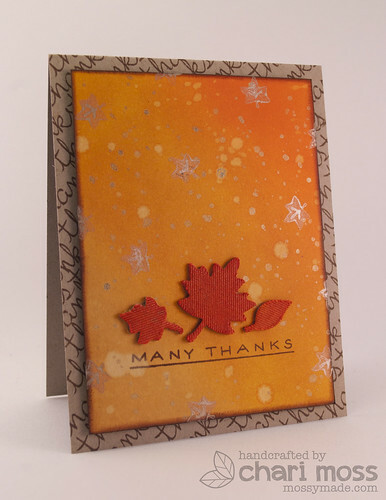 So rather than scrap it, I attempted to fix the mistake by stamping little leaves using metallic distress stain. It actually had an interesting effect. The stain pooled up in the void of the stamp and made the little lines inside the leaf stand out more. Pretty cool! 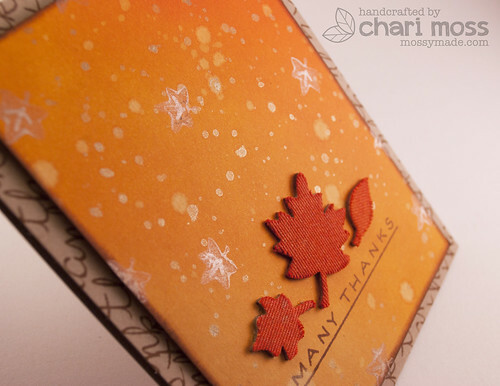 I finished off by stamping text on the kraft cardstock base to create a pattern. Be sure to visit the Young Crafters Unite Blog to see the rest of the creations by the Design Team and play along yourself for a great prize. A Simon Says Stamp gift certificate! On another note: Right now you can get 20% off your entire order at Neat & Tangled Stamps! Just use the coupon code TANGLES this code is good until Wednesday, October 24 11:59pm EST. oh wow!!! that is one amazing card!!! it's so warm and inviting!! i love it!!! and i LOVED reading about how you made it! the flicking with water and perfect pearls is the perfect touch! Um, you totally captured Fall. On a card. Completely gorgeous! I love this! The color of the background is fall heaven!